Eve Sanchez Silver had her first abortion at age 16 and her second at age 21. In 1998 she started fighting her first of two bouts with breast cancer, undergoing a lumpectomy, mastectomy, and breast reconstruction. Silver has come to believe that her abortions increased her breast cancer risk, so when she discovered she was active in an organization—Susan G. Komen for the Cure—that gives grants to Planned Parenthood, she thought it was "really horrific." Silver, director of Cinta Latina Research, helped found a minority advisory council for Komen, served on a review board, and spoke on its behalf until she resigned in 2004. "They were supposed to be a life-affirming organization and this other organization was killing people," Silver said. "I resigned because I felt that they were being duplicitous and that they were not supporting the very women they claimed they were supporting." Other pro-life activists—Karen Malec with the Coalition for Abortion/Breast Cancer, and Leslie Hanks, vice president of Colorado Right to Life, among others—have drawn attention to the grants for years. Komen counters that the money goes to breast cancer screening, not abortions, and says that newer research disproves any abortion-breast cancer link. Local Komen affiliates, not the national organization, give local Planned Parenthoods grants marked "breast cancer screening, education and treatment." 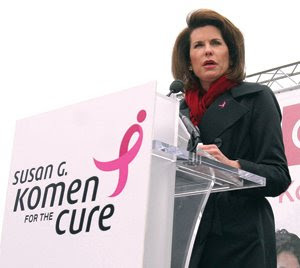 In 2008, 22 Komen affiliates gave grants to Planned Parenthood organizations or programs connected with Planned Parenthood. The dollar amount for 2008 is not yet available, but in the 2006-2007 fiscal year, Komen gave Planned Parenthood approximately $100,000 in grants. For women in remote areas, "oftentimes these Planned Parenthood programs are really the only option," said John Hammarley, news bureau chief for Komen. Komen's Southern Nevada affiliate funds a Mammovan that parks at both local churches and Planned Parenthood offices, providing free screening and diagnostic mammograms. But most of the 2008 programs serve urban, not isolated, populations. Komen affiliates have always funded multiple organizations from the same geographical area, so in these cases Planned Parenthood isn't the only option. Some pro-life groups have argued that there is a link between abortion and breast cancer. According to Angela Lanfranchi, a breast cancer surgeon, women who have a full-term birth have reduced breast cancer risk, so abortion removes this protection. Most doctors agree. But Lanfranchi would add that abortions, both spontaneous and induced, create cancer-vulnerable breast tissue—an assertion other doctors dispute but one she says has its basis in the basic textbook physiology of the breast. A 1989 New York study looked at fetal death certificates and then looked for the mothers in breast cancer registries, finding higher odds for cancer in women under 40 who had either a spontaneous or induced abortion. Komen says newer evidence contradicts this. In 2003, 100 experts from the National Cancer Institute concluded there was no link between breast cancer and either miscarriages or induced abortions. Harvard University and Oxford University have found similar results in the past two years. With the possible link between abortion and breast cancer and reason to distrust Planned Parenthood, Malec called the grants unnecessary: "They do not have to give funds to Planned Parenthood for breast cancer screenings. There are many other organizations that can receive those funds, and I think by giving them these funds it whitewashes what Planned Parenthood does."